St Mark James First Aid and CPR Certification in Kelowna, B.C. Home » St Mark James First Aid and CPR Certification in Kelowna, B.C. Since 2009, getting certified by St Mark James is quick and easy through Kelowna First Aid’s training programs for cardiopulmonary resuscitation (CPR), automated external defibrillation (AED), and first aid. Classes are offered at the cheapest rates in Kelowna and are available at various schedules throughout the week. Enrolling to the class you need is easy with the large selection of classes offered at Kelowna First Aid. Visit the Kelowna First Aid website by clicking here. A complete list of available classes, schedules, and rates are available on the website, along with a registration form. Prospective student can also complete their enrolment with the registration form below or via e-mail, telephone call, or walk-in during business hours in any of Kelowna First Aid’s training centers. Use the following information to contact this provider. Friendly customer service representatives are available during regular business hours. The following is the price list for this registered workplace approved provider. All prices include tax, course manual and all applicable fees. 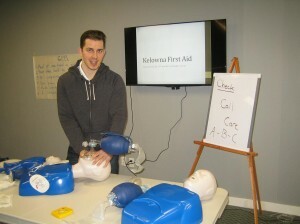 Why enrol in a training program with Kelowna First Aid? Kelowna First Aid offers the largest selection of training courses in the Kelowna area. Full training courses, stand-alone classes, private classes, and refresher courses are available for enrolment. Full cardiopulmonary resuscitation (CPR) courses have three levels, each level inclusive of first aid and automated external defibrillation (AED) training. Stand-alone classes for CPR and first aid are also available to trainees who do not want to enrol in the full training course. Private classes are usually offered to big groups of trainees or companies who request separate training classes and schedules. Course rates offered by Kelowna First Aid are the lowest in the area. The rates are inclusive of taxes, certification fees, and training manuals. Trainees don’t incur any additional expenses during the training period. Trainees who drop out are entitled to a full refund of the enrolment fee, provided a 72-hour notice is given beforehand. workplace approved training certificates are awarded to trainees who are able to complete a training course. The certificate is valid for three years throughout Canada and will meet whatever requirement the trainee needs it for. Training facilities at Kelowna First Aid are high end, complete with the latest training equipment for CPR and first aid. GERD is Gastroesophageal Reflux Disease is a condition where bile and the contents of the stomach flows back or “refluxes” back into the esophagus. This causes symptoms of heart burn such as abdominal pain, chest pain, vomiting, and difficulty breathing. GERD irritates the esophagus lining, causing pain, vomiting, and other symptoms.